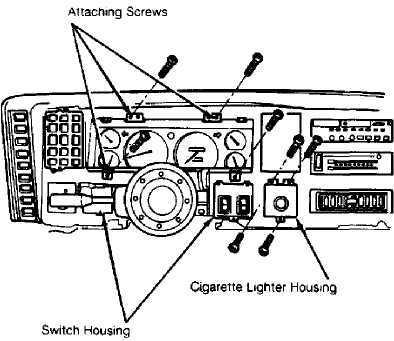 Instrument panel is supplied voltage through gauges fuse. A printed circuit on rear of instrument cluster distributes voltage to gauges and indicators. Emission Maintenance Timer and Indicator Light activate when mileage reaches scheduled maintenance interval of 82,500 miles. Timer can be reset using DRB-II. Compare resistance values of malfunctioning gauge to specifications. See OIL PRESSURE GAUGE RESISTANCE, FUEL GAUGE RESISTANCE and TEMPERATURE GAUGE RESISTANCE tables. repair open circuit to indicator. 2) With ignition switch off, measure resistance between brake warning switch connector Gray wire (changes to Gray/White wire at splice) and ground. If reading is zero ohms, check switch and/or brake system. If reading is not zero ohms, repair open circuit to parking brake switch ground. Turn ignition switch on with engine off. Disconnect coolant temperature sending unit connector (located at left rear of engine). If needle does not indicate at low end of scale, touch connector Violet/Yellow wire to ground. If needle indicates at high end of scale, replace sending unit. If needle does not indicate at high end of scale, repair open Violet/Yellow wire to gauge. Turn ignition switch on with engine off. Disconnect coolant temperature sender connector (located at left rear of engine). Touch connector Violet/Yellow wire to ground. If indicator lights, replace switch. 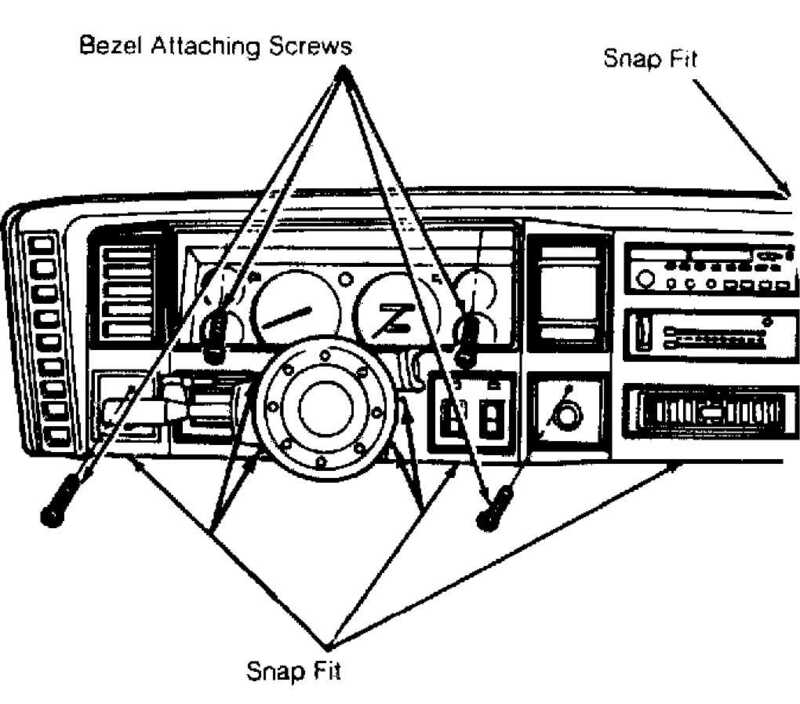 If bulb is good and indicator light remains off, repair open Violet/Yellow wire to instrument cluster terminal. With ignition on and engine off, disconnect fuel gauge sending unit connector. If needle goes to "E", replace sending unit. If needle does not go to "E", connect fuel gauge sending unit connector and disconnect instrument cluster connector terminal B1. Check resistance of sending unit. If resistance is 5-105 ohms, replace gauge. If resistance is not 5-105 ohms, repair open Dark Blue wire to sending unit. Check gauge fuses. Replace if blown. Test instrument cluster connector terminal A3 ground wire. See Figs. 1 and 2. If any resistance to ground is detected, repair open Black wire in ground circuit. ground is almost zero (allowing for bulb filaments), system is good. distributor. If needle goes to high indication, system is good. gauge (instrument cluster terminal B7). See Figs. 1 and 2. Turn ignition on with engine off. Touch oil pressure switch connector Gray wire to ground. If light glows, replace switch. If light does not glow and bulb is good, repair open in Gray wire to instrument cluster connector terminal B7. See Figs. 1 and 2.
open in Black/Yellow wire circuit to indicator light. Gray/Light Blue wire for short or open circuits. 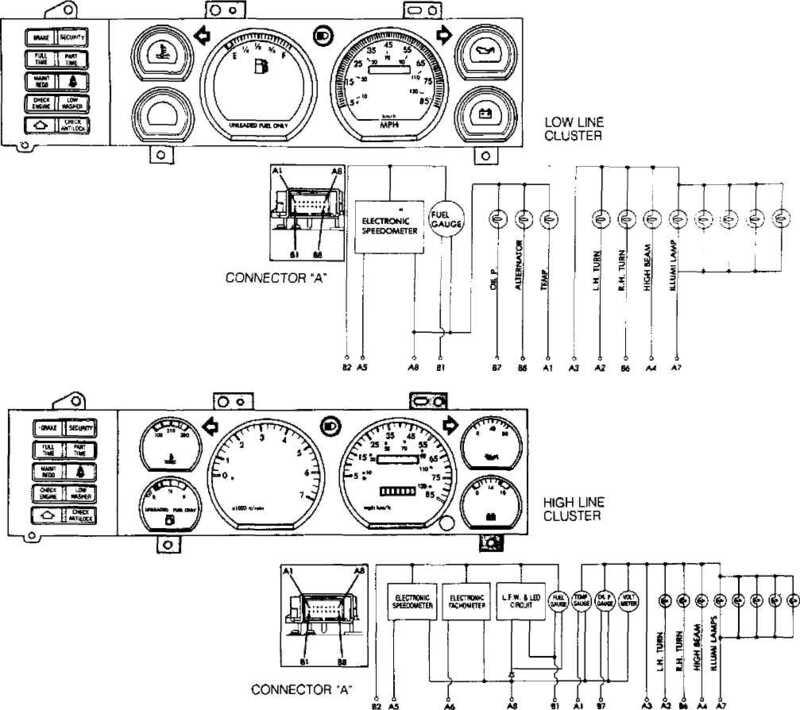 If wire is okay, see appropriate G - TESTS W/CODES article in the ENGINE PERFORMANCE Section. Turn ignition on with engine off. If voltmeter does not indicate battery voltage, check voltage at instrument cluster connector terminal A8. See Figs. 1 and 2. If battery voltage exists at terminal A8, replace voltmeter. If battery voltage does not exist at terminal A8, repair open White/Black wire circuit to gauges fuse. Fig. 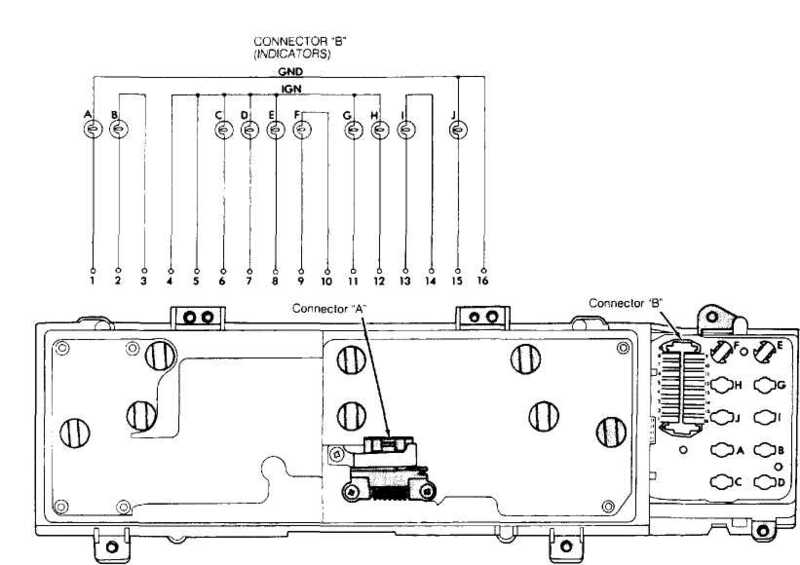 1: Instrument Cluster Connector ID & Location Courtesy of Chrysler Corp. Fig. 2: Instrument Cluster Connector Terminal ID Courtesy of Chrysler Corp.
cluster bezel attaching screws, and unsnap instrument cluster bezel. switch housing attaching screws. See Fig. 4. Fig. 3: Removing Instrument Cluster Bezel Courtesy of Chrysler Corp. Fig. 4: Removing Instrument Cluster Courtesy of Chrysler Corp. Fig. 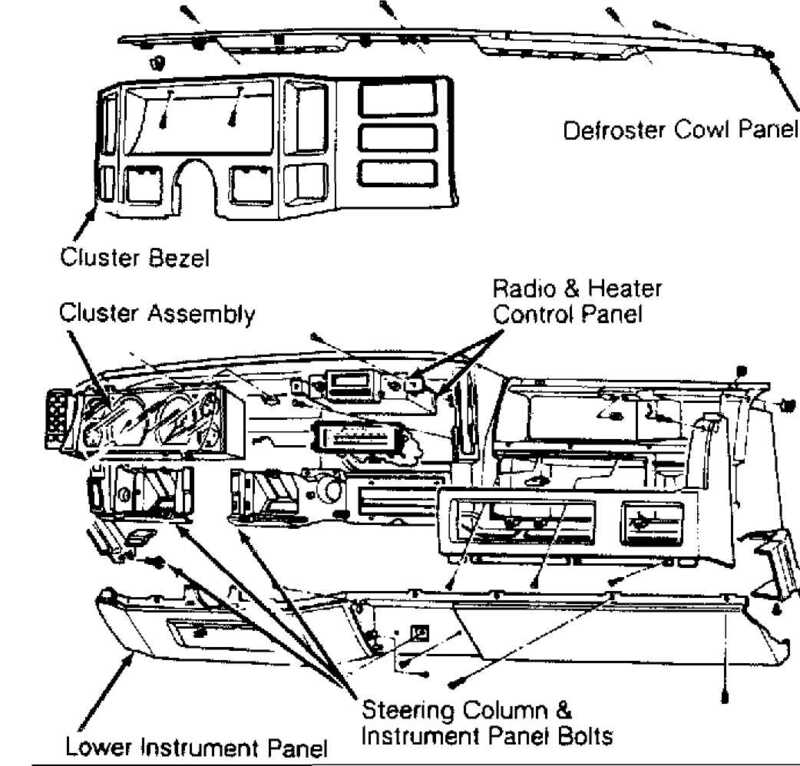 5: Exploded View Of Instrument Cluster Courtesy of Chrysler Corp. Fig. 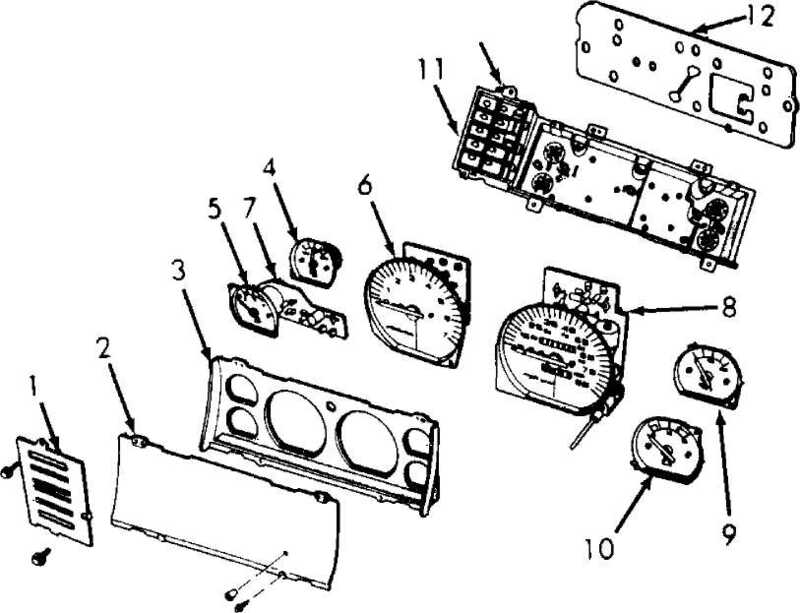 6: Exploded View Of Instrument Panel Courtesy of Chrysler Corp.